This page shows how the Mentoring Summit in Indianapolis is borrowing from ideas of the Tutor/Mentor Leadership and Networking Conference in Chicago. 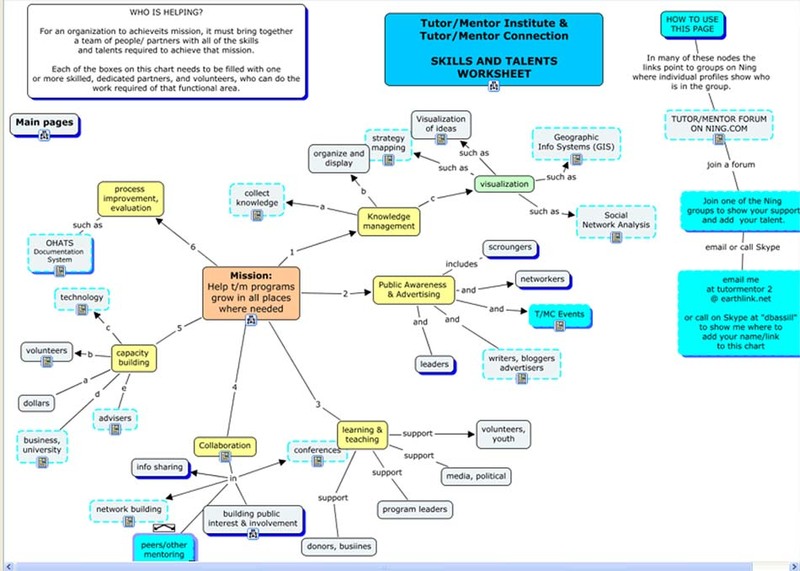 Join the Tutor/Mentor Conference planning and follow up group on the Tutor/Mentor Connection forum. I'm trying to organize a November Conference in Chicago, but need to find at least $10k in sponsor dollars and/or donated space. 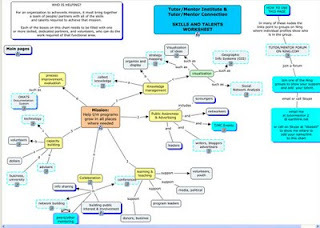 We'll offer this under the Tutor/Mentor Institute LLC structure which I've created in July to support the continued growth and operations of the Tutor/Mentor Connection in Chicago. Contact me on Skype, Linked In, Twitter or Facebook, to offer your ideas and support. Sign up for the Indianapolis Summit via their web site. July 18th article in Washington Post talks about an "unuhttp://www.blogger.com/img/blank.gifsual education roundtable" hosted by President Obama. It's considered unusual because business leaders and not educators are the main attendees. It would be great if these leaders were using their visibility, communications and influence to do on-going advertising that draws employees and customers to schools and non-school youth tutoring/mentoring programs in high poverty neighborhoods and if teams of employees were volunteering time to help high-quality tutor/mentor programs grow and operate in the same manner that corporate offices help hundreds or thousands of branch locations operate throughout the counhttp://www.blogger.com/img/blank.giftry. Such a strategy needs to go beyond supporting the brand name and well known organizations that only serve a small fraction of the kids in neighborhoods with poverty and poor schools. 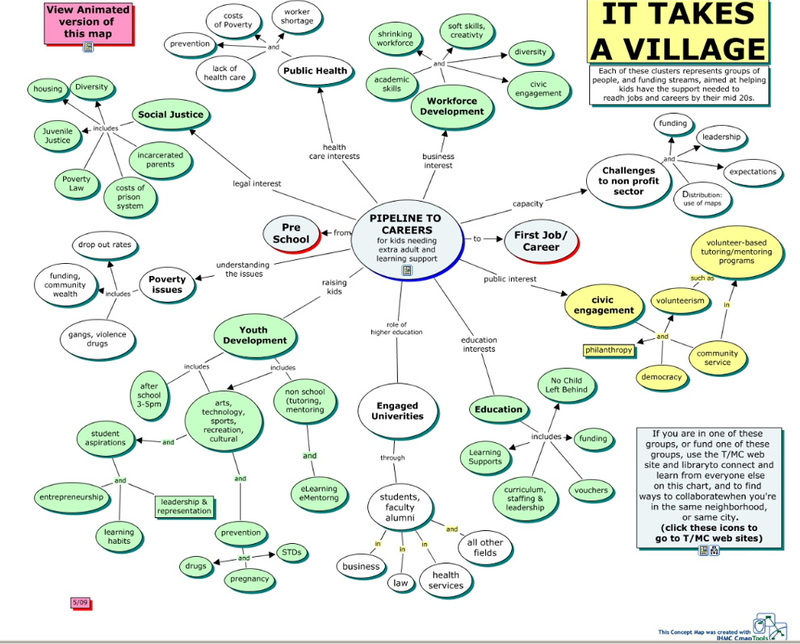 Cities need to create on-line program locator/map-based directories such as the one we host in Chicago. See http://www.tutormentorprogramlocator.net . With platforms like this volunteers can choose from programs in many neighborhoods. They can helphttp://www.blogger.com/img/blank.gif small and under funded programs constantly improve, while helping well funded programs draw from ideas of local, national and international programs to also constantly innovate new ways to keep youth and volunteers connected. Several cities do have program locators, but don't use these as platforms to attract volunteers and donors directly to the programs they list. It's hard to know if they use them to assess the distribution and availability of needed programs in areas with highest concentration of need based on poverty and locations of poorly performing schools, or high drop out rate schools. The service we host in Chicago is a pilot and has room for much improvement. Yet, I've found few map-based marketing strategies used by business to encourage volunteer involvement in programs designed to provide long-term mentoring, tutoring and career-education resources. 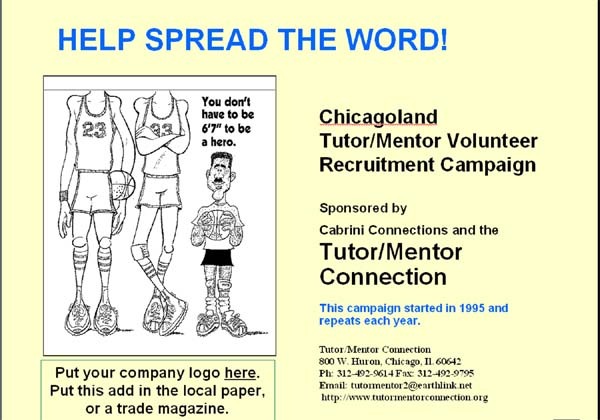 Today is my last day on the payroll of Cabrini Connections, the Chicago tutor/mentor program that I and six other volunteers created in the fall of 1992. I've been the president CEO for the past 18 years. While we operate a single tutor/mentor program serving a small group of youth, my 35 years leading a tutor/mentor program, and my advertising background with the Montgomery Ward Corporation, led me to create the Tutor/Mentor Connection in 1993 at the same time as we were creating Cabrini Connections. Our goal was to build a system of supports that would help more children in Chicago be able to participate in high quality tutor/mentor programs by increasing the way those programs are supported by volunteers, donors, media, etc. 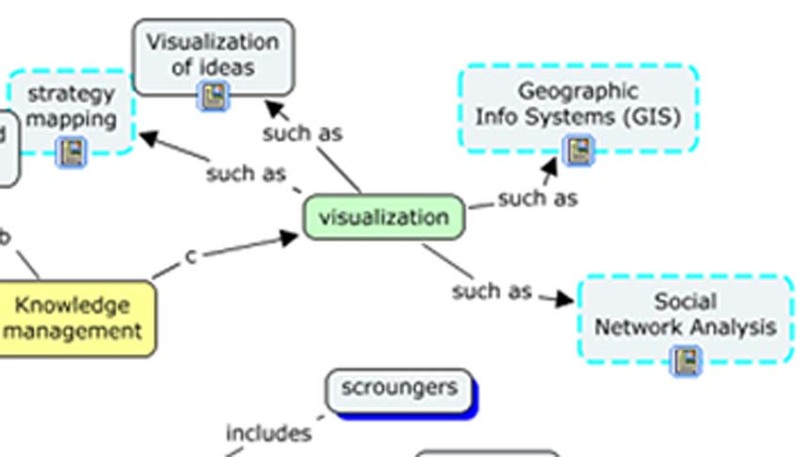 The video below illustrates some of the ideas I've developed over the past two decades. Unfortunately we've not been able to attract the high profile leadership, celebrity or political support that is essential to raising the philanthropic capital needed to do what we're trying to do. In the end, the struggle to find money to operate the Cabrini Connections part caused the volunteer Board of Directors to decide they can no longer support the Tutor/Mentor Connection. Thus, I'm leaving the organization I started and have led for so many years and re-launching the Tutor/Mentor Connection. Initially I'm creating Tutor/Mentor Institute, LLC, which will enable me to move forward in organizing a November Conference, and see financial support from investors and others who believe in what we're trying to do. I'll be working from my basement in Park Ridge and from donated space at HIGHSIGHT, located at 315 W. Walton in Chicago, which is one of the many Chicago tutor/mentor programs I've been connected to for more than 15 years. The change from being part of Cabrini Connections to being a separate entity has happened quite quickly so many of the important details -- like how to generate income to support what we do and pay me and others to provide our time and talent -- have not been worked out. Yet, in February 1990 when I left my job at Montgomery Ward, I did not know where the money was going to come from, yet I was committed to continuing my leadership of the tutoring program at Wards which I had led as a volunteer since 1975. When I left the my role as Executive Directory and founder of the Cabrini-Green Tutoring Program in October 1992 I did not know where the money and help was going to come from to start Cabrini Connections and the Tutor/Mentor Connection. Yet we've raised more than $6 million and involved more than 580 teens and 800 volunteers in the Cabrini Connections program since 1993. 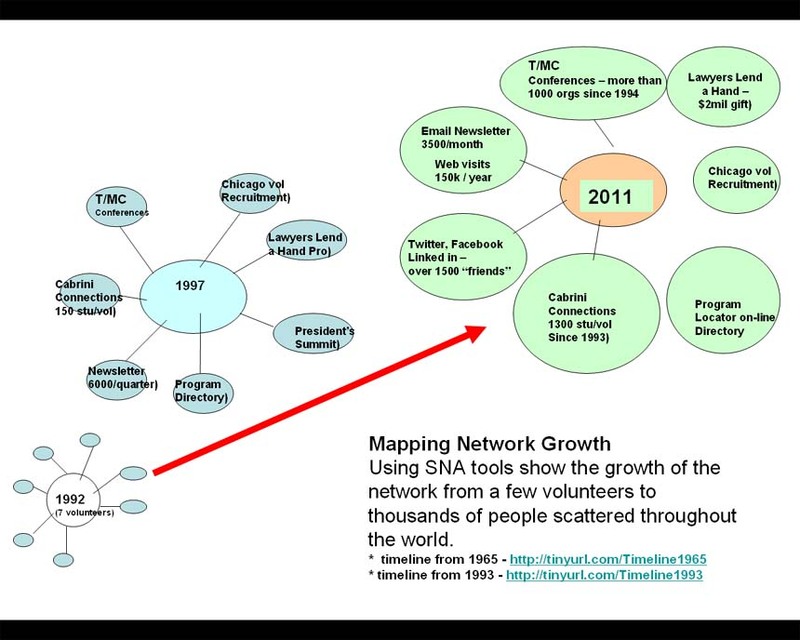 We've created a Tutor/Mentor Connection that connects the web sites and ideas of most of the tutor/mentor programs in Chicago to each other, and connects Chicago programs to the ideas of others around the world. We still don't have a leadership system in Chicago or any other city that applies the ideas of the Tutor/Mentor Connection or draws consistent financial support to tutor/mentor programs in every neighborhood on a consistent and on-going basis. Thus we have an uneven distribution of programs, uneven quality, and inconsistent growth caused by constant changes of personnel. So by leaving the CEO role at Cabrini Connections I will have much more time to devote to building tools that support collective efforts, collaboration, innovation and the on-going general operations of volunteer-based tutor/mentor programs in Chicago and in other big cities of the world. I hope you'll follow my progress, join the journey, and help put some financial gas in the engine so we can do this better then we've been able to in the past. Thank you all for your support and thank you to the youth, parents, volunteers and friends of Cabrini Connections who have let me be part of your lives for so many years. To those who give, much is given in return. I have given over 35 years to Cabrini Green youth and I believe I have been well rewarded through the love and friendship of the people I've met. 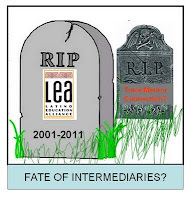 I received this message in today's email: "Latino Education Alliance (LEA) is closing its doors after 10 years as a nonprofit serving Latino high school students and families in Chicago. 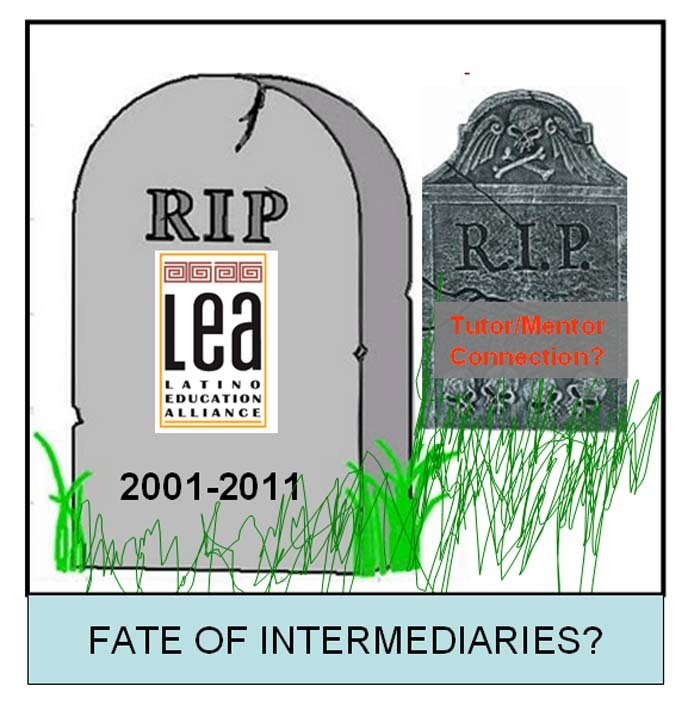 The decision to close Latino Education Alliance follows a year-long effort to reduce costs, the exploration of an affiliation with other agencies and conversations with our historic funding partners." If you've been following my blog you know that Tutor/Mentor Connection also faces an uncertain future. Funding challenges have led the Directors of the Cabrini Connections, Tutor/Mentor Connection to decide to no longer support the T/MC strategy. Friday, July 15, 2011 is my last day as President, CEO of the combined organization. However, it's not yet the final act. I've decided to create Tutor/Mentor Institute, LLC to continue to innovate new products and services that can help cities support the growth of high quality, volunteer-based tutor/mentor programs that reach a growing number of k-12 kids living in high poverty areas. For me to succeed I need to attract volunteers and leaders with the skills shown in this graphic and/or I need to attract investors and donors who will provide the funds for me to hire people with these skills. This is not starting over, or even starting new. I'm continuing on the same road, just changing from one mode of transportation to another. For a while that might seem like a move from a used 2005 Ford to a used 1999 Chevy. But as long as I'm able to steer and stay on the road, I think I can find a newer vehicle to carry the T/MC forward in the future. If you're interested in helping join in at the T/MC forum on Ning or lets connect on Skype. My handle is "dbassill". 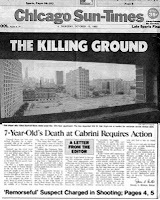 Today's Chicago SunTimes includes a half-page story about a nine-year old boy being shot in his back yard. According to the SunTimes story there have been 114 weapons-related crimes committed in the last year within a half block radius of where this shooting took place. What is going to change this? 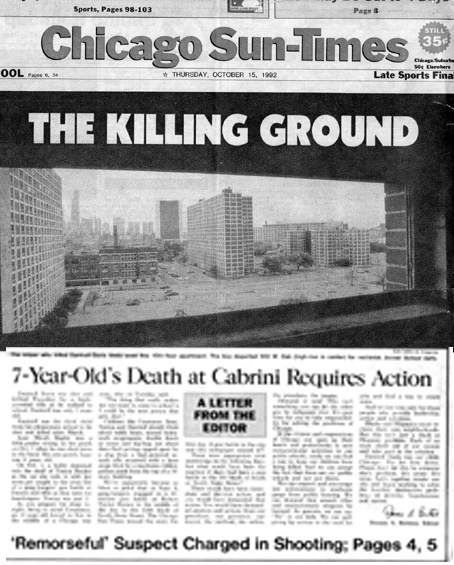 I've written about the violence in Roseland and in Chicago many times in the past six years. 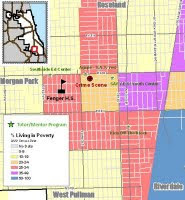 The maps I include are from the Chicago Tutor/Mentor Program Locator, which hosts a directory of non-school tutor/mentor programs operating in different parts of the city. My intention is to follow up "bad news" media with a much more consistent call to action that recruits volunteers, leaders, donors from the suburbs and the city to help a wider range of volunteer-based, k-12, tutor/mentor programs become available in more parts of Roseland and other areas where poverty reduces the range of opportunities and activities available to youth in the area and gives a wide open path for gangs and negative influences to expand. My stories alone will not raise the type of visibility needed to change the flow of resources and the availability of high-quality non-school learning and mentoring centers. However, anyone can use the Program Locator to create their own map-stories. This guide shows how. When students and volunteers from high schools, colleges, businesses and faith groups begin to use these maps and create their own stories we will create an orchestra of voices that will have the collective weight of a U2 Concert, and a collective impact on the growth of programs in all high poverty areas of Chicago and other cities with similar problems. The Program Locator is available to everyone but it is currently funded by no one. If your company or philanthropy want to help us keep this resource available for Chicago and share it with other cities we need your financial investment. Email Dan Bassill at tutormentor2@earthlink.net if you want to offer your help. This spring we've hosted interns from the Adler School of Professional Psychology and from Illinois Institute of Technology. 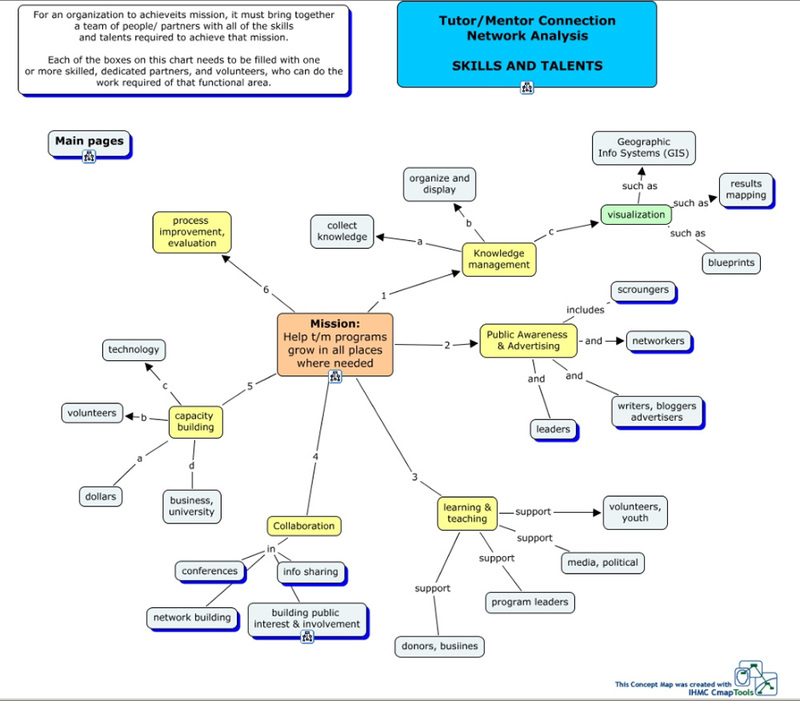 You can see examples of the work these interns have done by reading the blog articles on the Tutor/Mentor Connection forum. You can see more intern work on this blog. Joseph Kruel served a five month internship. He's a first year graduate student at the Adler School of Professional Psychology. His goal was to learn about the Tutor/Mentor Connection and communicate that to his network and his university. In this article Joseph writes "Throughout my internship at T/MC, I have been struggling with the idea of how universities can become actively involved in the nonprofit sector and with tutor/mentor programs, and even provide a source of constant revenue." He concludes with a "call for partnerships between universities and nonprofits such as T/MC, much in a similar design that the partnerships in the report were designed as." 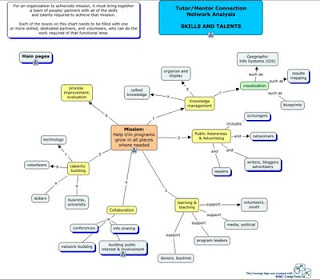 I've written several articles showing ways universities and their alumni could become strategic leaders of Tutor/Mentor Connection strategies in their own communities. This PDF is a strategic plan developed by grad students at DePaul, intended to kick-start the planning a university might go through to adopt the T/MC. With the Tutor/Mentor Connection going through a restructuring now would be a great time for an alumni of one of the hundreds of universities located in urban areas of the US to decide that his $35-$50 million gift ought to go to establishing a Tutor/Mentor Connection Institute on his own campus.